LAS VEGAS, MARCH 21, 2014—Miller Camera Support, LLC, a leader in the production of innovating camera support solutions, is hosting a charitable raffle event at the 2014 NAB Show (Booth C9520) as part of the company’s 60th anniversary celebrations. 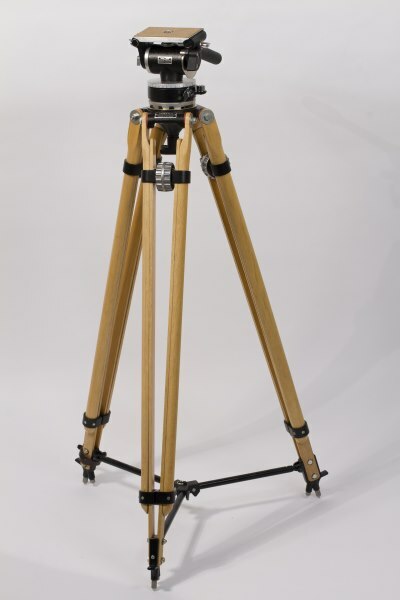 The Australian-owned camera support equipment company will toast its success with champagne and announce the winner of an exclusive giveaway of a limited edition Miller LP ’54 Classic tripod on Tuesday, April 8, at 4:30pm. All proceeds from the raffle will be donated to the NAB Education Foundation. The raffle is open to the public, and all participants are invited to purchase tickets leading up to the NAB Show until 4:00pm on the day of the event. Tickets are available for purchase at www.nabef.org/donate, and participants will have the option of purchasing one ticket for a small donation of $10, three tickets for a bundled package price of $25, or seven tickets for a bundled package price of $50. Additionally, NAB Show attendees who enter the raffle are invited to collect their free Miller 60th Year anniversary camera plate locking key ring at the Miller Camera Support, LLC NAB Booth (C9520). 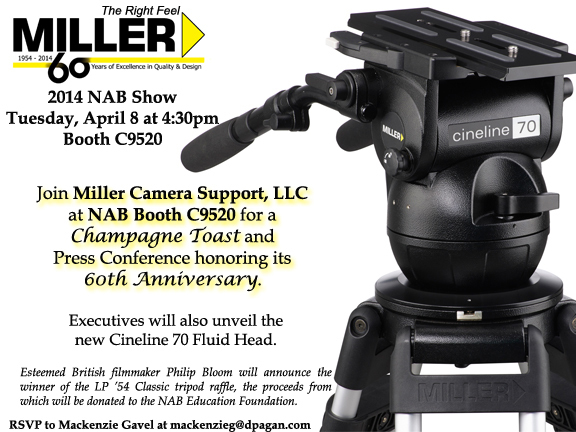 At the culmination of the NAB Show celebratory event, esteemed British filmmaker Philip Bloom will announce one, lucky raffle winner who will walk away the owner of a brand new, limited edition Miller LP ’54 Classic tripod, the original Light Professional tripod and head, built by hand as they were when first introduced in 1954. Not available for sale, only 40 of these rare, collector’s items will be produced for worldwide distribution, and each tripod will be numbered and come with its own certificate of authentication and wooden encasement, crafted from the finest New Guinean hardwood. The National Association of Broadcasters Education Foundation is a non-profit organization dedicated to reinforcing the future of broadcasting through a commitment to education and to advancing excellence in the diversity and community service efforts of our industry. Learn more at www.nabef.org. NABEF offers a number of professional development programs and initiatives to achieve this mission, including the Broadcast Leadership Training program, Media Sales Institute, Leadership Development Program, and many more. In 2013, NABEF provided training, career counseling, scholarships and leadership development to over 2,000 individuals. Founded in 1954, Miller Camera Support Equipment designs and delivers professional fluid heads and tripods to the film and television industry, providing support for the world’s leading camera operators. Celebrating sixty years in the industry, Miller is a longtime, global leader in the field of contemporary camera support and holds the first patent for fluid head design for film cameras, which it obtained in 1946. Today, Miller’s tripod and camera support systems are frequently used during electronic news gatherings (ENG), electronic field production (EFP), and digital video applications by the world’s leading networks, production houses, corporate, educational and government institutions in more than 65 countries. For more information, call +61 2 9439 6377 or visit www.millertripods.com.